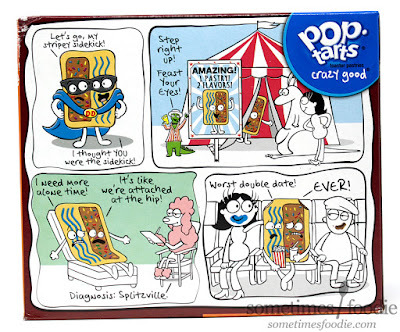 Have any one you seen a real-life Pop-Tart that looked anything like the picture on the front of the box? This. 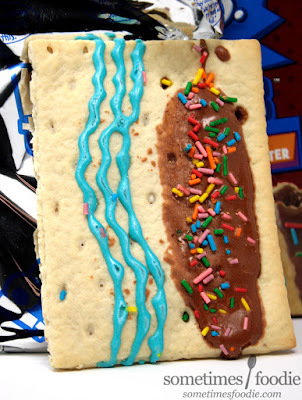 A sad un-even schmeer of chocolate icing with densely packed tiny Sprinkles and a sad, but wiggly, wave of blue icing. Looking at this completely out of context, it's just...sad. Let's hope it tastes better than it looks. Eaten right out of the package, the texture is soft and chewy, like a soft-baked cookie. Speaking of cookies, the sugar cookie side is mellow, vanilla'd and reminiscent of the sugar cookie Pop-Tarts released during the winter. 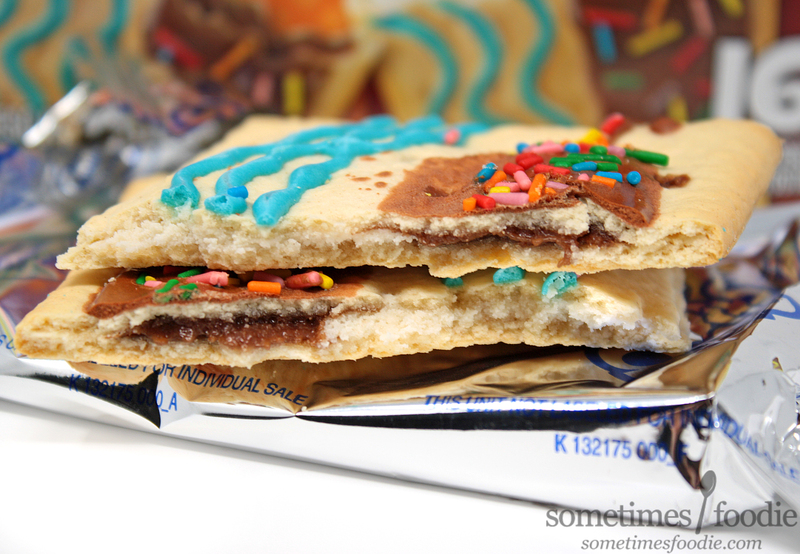 It's soft, sweet, and similar to eating a small amount of raw sugar cookie dough layered between two dry pie crusts, but due to the split fillings, the crust to filling ratio is way off and no-one eats Pop-Tarts for the crust. The brownie side is a bit better balanced, thanks to the chocolate icing, but not by much. The filling is gritty and brownie-batter-like, but again, there is far too much crust-to-filling ratio than I'd prefer. The filling that is there is pretty authentic tasting and quite delicious, there just isn't enough of it to overcome the lack of toppings and overwhelmingly dry crust. Combined, you get the best of both worlds. 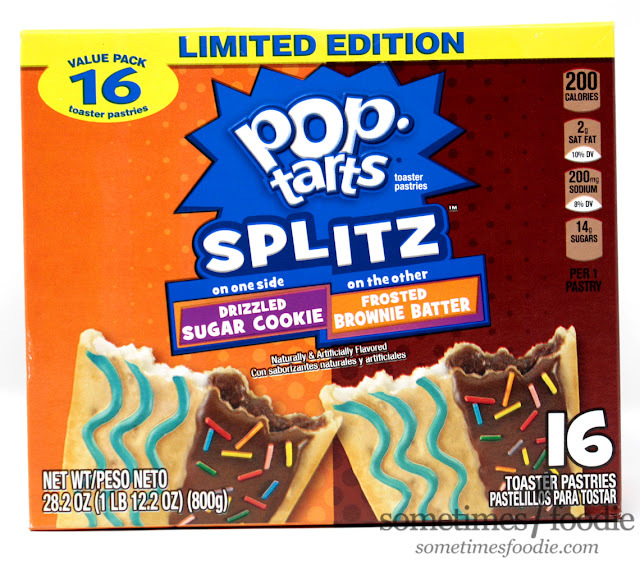 You get the creamy sweetness of the sugar cookie filling mixed with sweet milk-chocolate brownie batter. It's pretty delicious actually, but the areas where the fillings overlap are quite small, which is a pity. Toasted, it makes the kitchen smell like you just baked cookies, which is a plus, and it does enhance a few of the flavors. The chocolate side takes on a hot-fudge-like texture and flavor the is reminiscent of their Hot Fudge Sundae flavor. Unfortunately, the sugar-cookie side isn't as lovely when toasted and the cookie-like aspects of this flavor are considerably diminished leaving you with a warm vanilla nothingness. 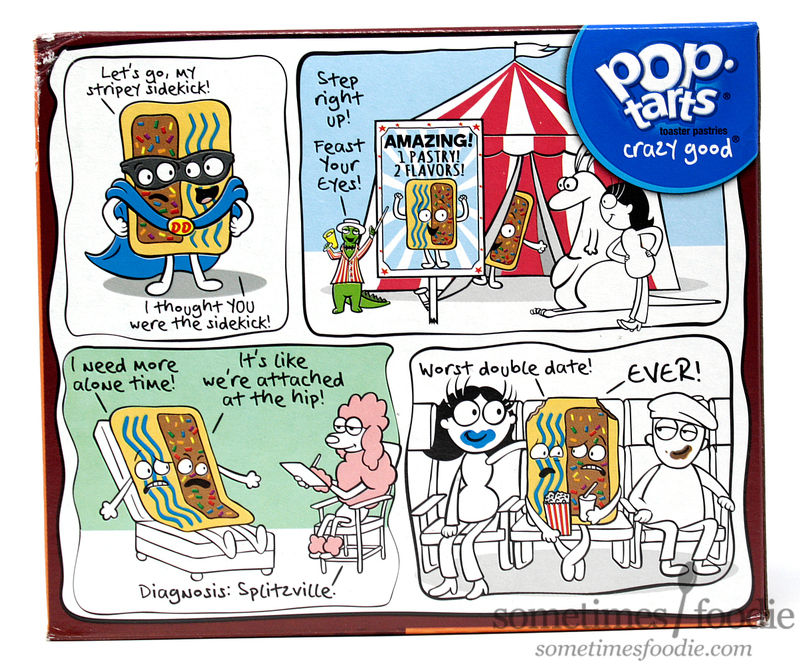 I prefer to eat most of my Pop-Tarts right out of the box, but even with my personal preference, I think this flavor in particular is best eaten raw if you want a true cookie dough and brownie batter snacking experience. As-is, this is a sweet snack and a pretty satisfying Pop-Tart, but it wouldn't make my top 5.